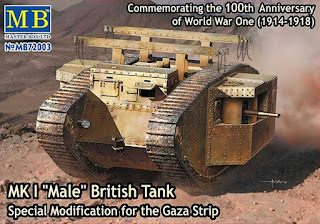 Master Box Ltd. makes a number of British Mk I tanks, including versions that were part of the Machine Gun Corps of the Egyptian Expeditionary Force. A nice build review of the kit can be found at Armorama. When I started my own build, I got stuck half-way because the instructions were missing the pages with steps 5–10. Luckily I was able to find some scans of the missing sections from an AMPS review of the kit. The "special modification" advertised for the kit are supports on the roof used to facilitate attachment and removal of the sponsons. 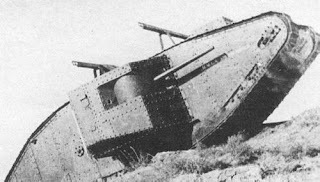 However, the only picture that I could find of a tank that had these supports was "Sir Archibald". Most pictures of the Mk I tanks used in Palestine did not seem to show them with these supports. In any event, the tank I wanted to model was "Ole Luk-Oie" (Old Shut-Eye), named in honor of Colonel Sir Ernest D. Swinton, who used Ole Luk-Oie (the God of Dreams from a story by Hans Christian Andersen) as a pen name for his published fiction. The kit was built pretty much OOB except for the following modifications. Part A3 was partially filled with Elmer's Tack to ensure that the barrel would stay in place when raised or lowered. The ends of the barrels were drilled out. 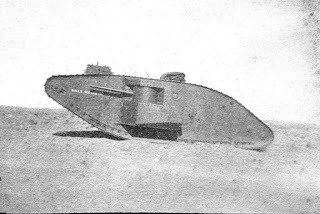 The "special modification" (steps 17–19) was not added, but I substituted a framework used for securing stowage on the roof of the tank instead. In hindsight, I should have attached the brass bars before closing up the hull, but it still worked out fine. The "L" from the H.M.L.S. decal of another tank was taken to change the misprinted "OIE-LUK-OIE" decal to "OLE LUK-OIE". The smaller decal I just left alone because the misspelling won't really be noticed due to its size. I scored the tracks where they wrapped around the end horns to try to avoid having the plates look overly curved, but I don't think it really made any difference. The final steps will be to paint the tracks, apply weathering, and maybe add some stowage before I can call this model finished.